The NCAA is not the only college athletic organization with sports programs. The National Association for intercollegiate Athletics (NAIA) has over 250 members. Like the NCAA, the NAIA regulates the number of scholarships available and students must register with the NAIA Eligibility Center. NAIA offers fewer sports than the NCAA but does offer more scholarships in some sports. The maximum number of scholarships allowed in baseball, men’s golf, men’s soccer, and men’s tennis are higher in the NAIA. The NCAA offers more scholarships in women’s sports compared to the NAIA. A total of 41 NAIA schools meet the 50-50 qualifications. 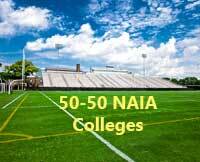 Of the 27 athletic conferences in the NAIA, 17 have 50-50 schools. The Crossroads League has six teams and the Great Plains Athletic Conference and SUNY Athletic Conference both have four schools each. The states with the most 50-50 NAIA schools are New York, California, Indiana, and Iowa. Texas, which has the most NAIA schools at 19, only has one school that meets the 50-50 qualifications. The following table lists the NAIA 50-50 schools by basketball conference. Schools may compete in different conference depending on the sport. Since many schools don’t compete in football, I choose to use the basketball conference. This data is from 2013 and the affiliation’s may not be current. In other words, some of it is probably no longer correct. As usual, the four-year graduation rate is used for private schools and the five-year rate is used for public schools.